Stories I Tell is is a body of work that I created during my tenure as a long-term artist in residence at Medalta’s International Artist in Residence Program in Medicine Hat, Alberta. You can view photos of the work here >>. And photos of the Cup Project here >>. In our modern world, we are surrounded by so much that is nameless and soulless: objects that have no identity other than that which we bring to them. We eat no-name food off no-name dishes, and wonder why we aren’t satisfied. I make pots because I truly believe that life is different when you choose to surround yourself with objects that already have a story when they reach you. There is a different tenor to your day when you encourage the objects you use to become part of the fabric of your life, rather than mere accessories. 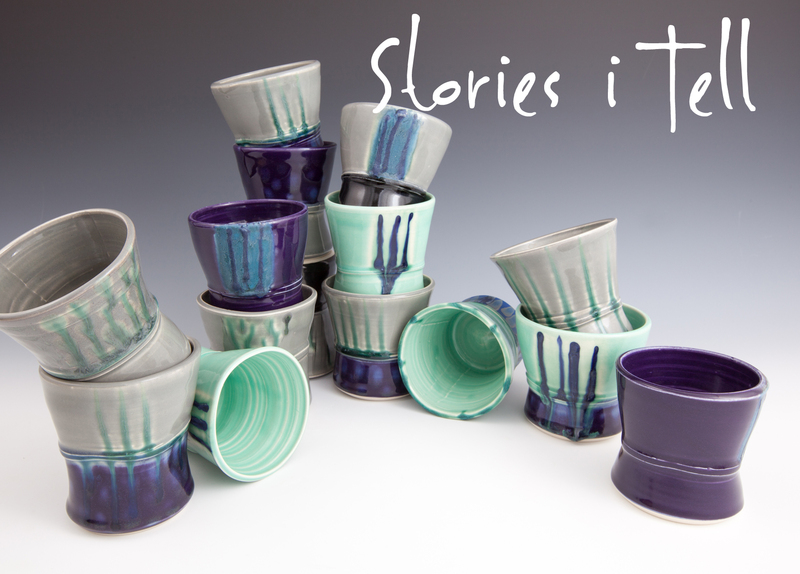 I make pots to add my voice to this story—creating useful objects that will hopefully bring joy to people’s daily lives, and go on to forge connections and stories of their own. My goal is always that my pots will introduce a little beauty into the world, and ideally create a space where the user can pause to savour a moment of calm in the midst of a busy day. However, despite the fact that I want the pots that I make to go out into the world and have lives of their own, it is difficult to part with these objects that have been created out of, and borne witness to my daily struggles, animadversions and triumphs, and I often wonder what becomes of them. I find it hard to believe that they aren’t somehow changed by their experiences; in my mind each one becomes its own little palimpsest of sorts—a pot collecting infinite layers of stories and experiences that somehow enrich it and give it a life independent of me the maker, and you the user. A unique patina of use, history and experience. Stories I Tell is my attempt at trying to reconcile these two disparate parts of a pots life—my process of making them, and your interaction with them. As such, a key part of this body of work is a collection of cups that will be given away, free of charge to members of the public throughout the exhibit, with the goal of demonstrating how the use of handmade objects can enrich one’s daily life. In exchange for the cup, the recipient will be asked to send a postcard to the artist with a short story or reflection on using the cup and will also be encouraged to tag tweets and photos to #storiesitell. Photos of the Cup Project can be viewed here >>.